It's time for another episode of 205 Live on the WWE Network! 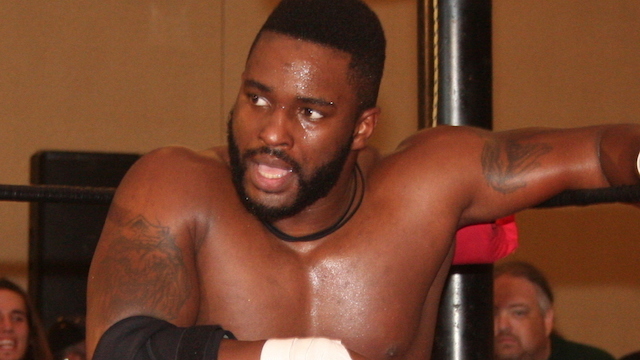 Last week, Cedric Alexander successfully defended his Cruiserweight Championship against Buddy Murphy. Alexander has proved that he belongs as champion and his era continues. Who will be the next challenger? Tune in for all the details. Hit F5 to refresh the live recap! We get clips from 205 Live last week focusing on the excellent championship match. General Manager Drake Maverick talks about the future starting tonight with two matches announced: Dorado vs. Kendrick; and Ali vs. Murphy. The Lucha House Party come out first as the commentators welcome us to the show. Brian Kendrick comes out next, but no Jack Gallagher by his side; instead, Drew Gulak accompanies Kendrick to the ring and joins commentary. Kendrick attacks Dorado at exactly the same time the bell dings and continues the punishment. Dorado slaps him with palm strikes until he cowers in a corner, then does a backflip dropkick and a headscissors. Kendrick falls out the ring, taunts Kalisto and Gran Metalik, Dorado goes after him, gives him a flying headscissors from the apron, throws him back in the ring, then Kendrick kicks his feet from thr apron. Kendrick throws him into the barricade, taunts the others again, throws Dorado back into the ring, stomps on him, kicks him in the back, delivers a sidewalk slam and gets a 2-count. Kendrick puts him in an armbar submission, Dorado fights back, Kendrick does another sidewalk slam, covers for 2, kicks him in the head, chokes him on the ropes, and taunts around the ring before choking him with his boot. He drops knees to the chest, delivers a butterfly suplex, covers for 2, then puts him back in the armbar and switches to a rear chinlock. Kalisto and Metalik keep swinging their noise-makers which makes Gulak glare at them. Kendrick whips Dorado into the turnbuckles with aggression a couple of times. Dorado finally comes back with a spinning heel kick, sticks a boot up in his face, does another headscissors takedown, chops, punches to the gut, gets tossed onto the apron, slams Kendrick's head on the top turnbuckle, climbs to the top rope, and lands a diving crossbody for a near-fall. Dorado dropkicks him out the ring, hits a suicide dive in front of the announce table, Gulak stands up, Dorado does the Lucha chant in front of him, Kendrick attacks Dorado from behind and attacks Metalik as well. Kendrick brings him into the ring, Dorado hits The Golden Rewind and covers for 3! WINNER: LINCE DORADO. Gulak cheap shots Kalisto from behind, then gets in the ring and attacks Dorado as well until he gets chased off. The Lucha House Party challenge him to get back in but Gulak and Kendrick head back up the ramp. The commentators talk about last week's Cruiserweight Championship match and that takes us to a video packages highlighting the big moments. Afterwards, we get comments from Mustafa Ali and he talks about deserving an opportunity at the championship again. He says Murphy thinks he might run right through him, but tonight Ali plans to prove that he's got the heart of a champion. TJP shakes his hand, pulls him in for a clothesline, then exits the ring for a microphone. "Killer boots man! I know you thought you'd make a name against the CruiserGreat, but not tonight." TJP hits a slingshot senton and continues talking. He locks up the guy's legs, says the GM is overlooking him, stomps his face into the mat, then says maybe the other GM's Paige, Kurt Angle or William Regal are more interested in him. He puts the guy in the Sharpshooter, says that time may come soon, then makes him tap out. WINNER: TJP. Vic Joseph, Nigel McGuinness and Percy Watson are all perplexed at what TJP meant by his comments. Next we get a video package for... LIO RUSH coming soon to 205 Live! "It's only a matter of time before 205 Live feels Rushed." Next week it's official: The Lucha House Party get their hands on Kendrick, Gallagher and Gulak in a 6-man tag team match. Ali heads to the ring first for the main event. Murphy is getting ready while talking to Tony Nese. Dasha interviews him asking if his setback last week changes his strategy. Nese butts in saying that he is still the same man. Murphy adds that he is still the juggernaut of 205 Live and everybody else "can't stop the unstoppable." The bell dings, this match is underway, Ali avoids him at first, but Murphy drives him back into the turnbuckles a couple of times. Ali goes for a sunset flip, Murphy blocks it, picks him up, throws him into a corner, Ali avoids him, chop, Murphy barely budges and shoves him back. Ali flips over him out a corner, another chop that doesn't faze Murphy, a third unaffected chop, punches him, ducks a few swings, hits a back elbow, Murphy grabs him by the hair, Ali lands on his feet from a back suplex, ducks a swing, cartwheels past him, hits a pop-up dropkick, and connects with a corkscrew plancha! Ali throws him back into the ring, climbs to the top rope, lands a diving crossbody for 2, Murphy shoves him away, tosses him onto the apron, Ali strikes, climbs up the turnbuckle, Murphy cuts him off, climbs up to him, Ali blocks a superplex, Murphy charges at him, Ali clocks him, goes to the top of the ringpost, Murphy picks him up onto his shoulders and DROPS him across the top turnbuckle! Murphy covers and gets a 2-count, hits a knee to the midsection, Irish whip, and Ali counters for a crucifix pin for 2. Murphy suplexes him onto the top rope, picks him up, hits a pendulum backbreaker, then a gutbuster, covers for 2, and puts him in a seated abdominal stretch. Ali counters out, shoves him into a corner, and hits a REVERSE FRANKENSTEINER spiking Murphy on the top of his head!! It looks BAD even in slow-mo! Both men are back up on their feet, Ali hits a back elbow, swings him onto the ropes, superkick, Murphy hits an elbow, Ali hits a springboard splash while Murphy's still in the ropes, crawls, makes the cover, hooks the leg and gets a 2-count. Ali hits a hard forearm, Murphy punches him back, Ali with the forearm, Murphy hits back then drops him with a shot to the gut, Ali continues to fight back, Murphy hits his combination, Ali avoids the kneelift and hits a spinning heel kick. Murphy punches hi, Ali superkicks him, Murphy catches his leg, Ali backflips landing on his feet, Murphy boots him in the face, Ali side-steps and swings onto the apron, kicks him in the head, slingshots back in but Murphy counters with a pop-up kneelift for 2.5! Murphy has an angry look on his face, Ali crawls to pick himself up by the ropes, Murphy sets up for a suplex on the apron, Ali fights off, Murphy shoves him back, Ali side-steps and swings through the ropes and into the ring , Murphy crashes into the ringpost, Ali gets back on the apron and hits the rolling sit-out facebuster ON THE APRON! Ali quickly throws him back into the ring, covers, gets a near-fall, and can't believe it's not over yet. Murphy sends him face-first into the turnbuckle, Ali hits a savate kick, hops onto the middle ropes, Murphy superkicks him through the legs to the face, then pulls him down with a spinning facebuster and covers for the 1-2-KICKOUT!! This match rightfully gets a "This is awesome!" chant from the crowd. Ali tries to pull himself up using the ropes but instead gets on the apron for better leverage. Murphy stalks him, grabs him by the hair, yells at him that HE is next in line, Ali trips him up dropping him back-first on the apron, charges at him, gets popped up to the ropes, climbs to the middle turnbuckle and turns it to a TORNADO DDT ON THE FLOOR!! Again Ali quickly brings him back into the ring, this time he climbs up to the top to finish him -- BUT FROM OUT OF NOWHERE HIDEO ITAMI PUNCHES HIM IN THE FACE! WINNER via DQ: MUSTAFA ALI. Itami starts pummeling Ali in the face and then smiles. Now Itami hits the hesitation dropkick to Buddy Murphy! He then swings Ali around to knee him in the face then shouts "Respect me!" More referees and agent Adam Pierce come out to check on the two competitors that Itami attacked. Itami exits the ring and smirks at his statement that he just made. That's all for 205 Live!